The changes to the CONCACAF Champions League fix some issues but ignore others and create even more for teams in MLS and Liga MX. CONCACAF has overhauled its Champions League tournament by streamlining the schedule and format, eliminating the group stage, creating a secondary competition/qualifier and raising as many questions as it’s answered. The changes unveiled Monday somehow solve some issues, ignore others and create new problems, all while delaying the entry of the MLS clubs that qualified last year until February 2018. MLS, the U.S. Soccer Federation and the Canadian Soccer Association signed off on the revisions, which will commence with the 2017-18 season. The ’16-’17 CCL will enter the quarterfinal stage next month with the MLS trio of FC Dallas, the New York Red Bulls and Vancouver Whitecaps still in contention. In 2008, CONCACAF created the Champions League by adding a group stage to its annual club tournament launched in 1962, thereby bringing it in line with others around the world. Although the four-team groups included MLS-Liga MX matchups, other games frequently were a tough sell. Crowds were small, travel was taxing and the competition dragged. So in 2012, four groups of four teams (plus a qualifying round) evolved into eight groups of three that reduced match days and travel and sent the winner to the quarterfinals. But that, too, failed to capture the imagination. MLS or Liga MX clubs have claimed 30 of the 40 available quarterfinal berths under that format, and then Mexican teams went on to fill nine of the past 10 spots in the finals. 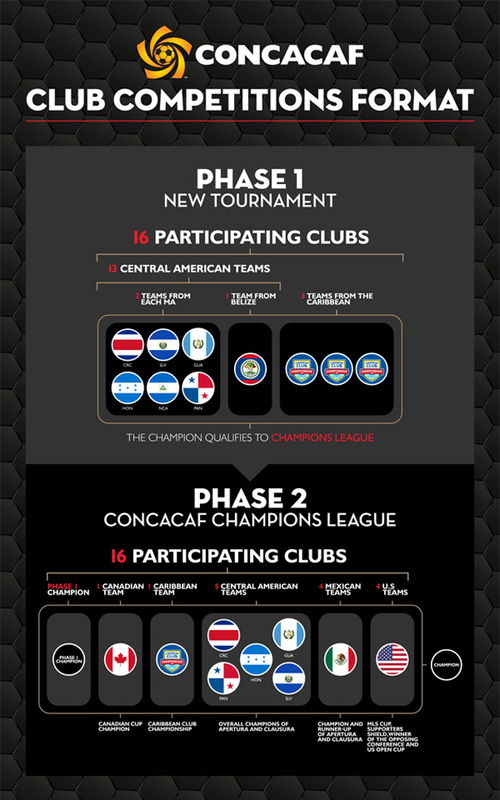 So starting this fall, the group stage will disappear as CONCACAF reverts to a traditional bracketed tournament. The hope is that knockout soccer will inject some tension and unpredictability. In August, 16 clubs from Central America (13) and the Caribbean (three) will contest a yet-to-be-named event that will qualify the winner for the CCL. In February 2018, that team—plus four from the USA, four from Mexico and one each from Canada, Costa Rica, El Salvador, Guatemala, Honduras, Panama and the Caribbean— will kick off the CCL’s round of 16. The champion will qualify for the ensuing FIFA Club World Cup. That means teams from the USA, Canada and Mexico will play from two to eight CCL matches, with the finals to be held each May. MLS’s primary complaint about the CCL has been the timing of the knockout rounds, which have started in late February or early March. At that time of year, clubs in warmer climates—meaning every country that isn’t the USA or Canada—are well into their seasons. MLS teams are coming off long, idle winters. And the rust is evident in the results. Over the past five campaigns, MLS entrants have won just four of 18 home-and-home, knockout-round series over non-MLS opposition. Most Liga MX teams certainly are stronger top to bottom than MLS foes. But it’s also true that the latter hasn’t enjoyed a level playing field. In the end, however, it appears that when MLS was forced to consider a CCL ending in October or early November—right in the middle of the stretch run and close to a FIFA break that already causes some scheduling havoc—it realized that knockout round games in February or March didn’t look so bad. The addition of a round of 16 also increases the chances that the opponent, if not an MLS team, is more manageable (see below). Overall, however, it doesn’t solve the off-season vs. midseason problem. For Liga MX, which has produced 11 consecutive regional champions, the length of time between the May CCL finals and the December Club World Cup seems to be a problem. Mexican participants have been miserable in the CWC since it expanded in 2005, finishing in the top three only once (Monterrey in 2012). The seven-month gap might have something to do with it. Nevertheless, it’s understood that the wait wasn’t a significant issue to Mexican clubs. With five MLS (or NASL/USL if they win the U.S. Open Cup or Canadian Championship) and four Liga MX teams in the CCL’s round-of-16, it’s inevitable that at least one series will be MLS vs. Liga MX or MLS vs. MLS. The primary question facing CONCACAF is whether it will keep MLS and Liga MX apart in the other seven round-of-16 series. That decision could have significant ramifications on the field and on CONCACAF’s finances. CONCACAF is working on creating an “index” similar to UEFA’s coefficient system designed to assist in the seeding process. Using and weighing results from the past nine CCL seasons, the governing body will measure the relative strength and performance of regions (North America, Central America and Caribbean), leagues and even individual berths. How does the Open Cup winner do, for example? Or the runner-up in the Liga MX Apertura? CONCACAF hasn’t announced which measurement it will prioritize, or if it will include commercial or logistical considerations in the bracketing. It will have to announce a decision by late May, when it will conduct the draw for the fall tournament. The same indexing/seeding procedure will be used for the 2018 CCL. Whatever the rationale, expect four of the five MLS clubs to be kept separate from each other and Liga MX opponents until the quarterfinals. MLS, the USSF and the CSA now face a new problem: figuring out how to make up for the gap between qualification and the beginning of the ensuing CCL. It wasn’t ideal before. Through the current CCL season, the four USA-based qualifiers (MLS champion, Open Cup winner and the first place teams in each of MLS’s two conferences) would have waited eight months or more to begin CCL play. Now the wait will be even longer. When the Seattle Sounders, FC Dallas, New York Red Bulls and Colorado Rapids enter the 2018 round of 16, it will have been 14-17 months since they qualified. For 2016 Canadian champion Toronto FC, the wait will be a ridiculous 20 months. It’s an absurd situation—one which MLS understands can’t continue. There will be changes to the timing. In Canada, the problem could be solved simply by removing CCL qualification from the 2017 Canadian Championship or by staging a playoff between the ’17 and ’18 winners. In the USA, it’ll be more complex. CONCACAF has no interest in holding a larger tournament in 2018 to accommodate additional qualifiers. So if MLS and the USSF want to get back on track quickly, they’ll have to find a way to cram the 2017 and ’18 qualifiers into the ’19 CCL. A playoff would do the trick. Another way to do it would be to decide that only the ’17 and ‘18 MLS Cup and U.S. Open Cup winners (for example) went through to the ’19 tournament. Either way, CONCACAF’s solution has presented a couple complex wrinkles. And it remains to be seen whether American and Canadian clubs can find a way to compete with Latin opposition in February and March.